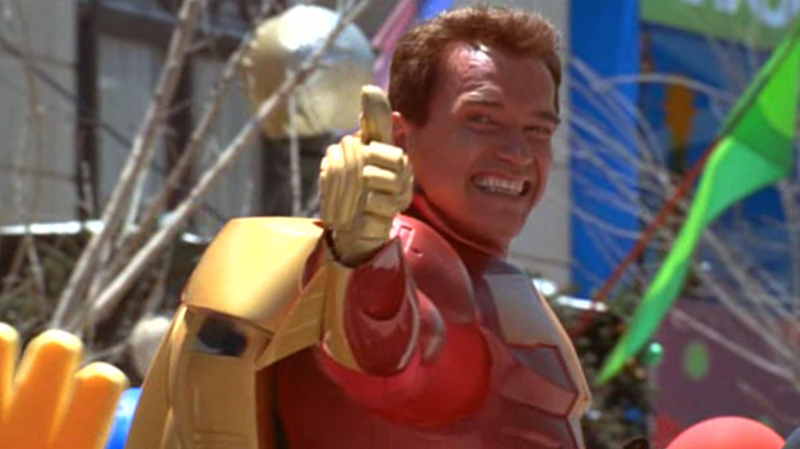 Jingle All The Way might be one of the silliest holiday movies of the past two decades, but Turbo Man will always be cool. Sadly, there aren’t too many copies of the original action figure left, and they’re mostly fought over on eBay. But one guy got his hands on the original props and is running a Kickstarter to bring Turbo Man back to life. That’s right, It’s Turbo Time! The ‘90s were a weird time for parents—really, any decade before online shopping. Amazon Prime didn’t exist yet, so when kids wanted the latest toy craze, adults had to physically fight tooth and nail to get their hands on one. There were in-store battles over Power Rangers, Tickle Me Elmos, Pokémon, even Tamagotchi. Oh God, the nightmares of trying to get a Tamagotchi. They haunt me to this day. Enter Jingle All The Way, a 1996 movie starring Arnold Schwarzenegger and Sinbad about two dads trying to score the hottest toy on the market, a Turbo Man doll, on Christmas Eve. It had satirical points it wanted to make about the insanity of consumer culture but mostly devolved into jokes about punching random Santas and reindeer. Also, Jake Lloyd was there. It’s one of those movies that if you grew up with it, it will always hold a special place in your heart...even if you know it’s kind of stupid. J.R. DeJesus is nearing his goal of raising $13,000 to recreate the Turbo Man doll that Schwarzenegger and Sinbad nearly killed each other over. According to the Kickstarter, DeJesus plans on making a posable version of the giant 14-inch figure that Schwarzenegger’s Howard hands “Jamie!” during the parade. Jingle All The Way’s director, Brian Levant, even gave him the original movie props so he could 3D-scan them for the project. DeJesus plans on making 100 dolls for the first rotation, and you can reserve one on Kickstarter for $130, before shipping. But beware of the holiday rush, 75 of them have already been claimed, so anyone not wanting to wind up like Howard on Christmas Eve should probably reserve one quickly.